Enquire or book a trip along Mỹ Tho - Sa Đéc - Cao Lãnh. Boarding at noon at My Tho. Welcome drink, introduction to the ship and crew. After lunch, transfer for a visit of the town of Sa Dec, following the tracks of French novelist Marguerite Duras: Home of "The Lover", the Trung Vuong primary school where French novel writer Marguerite Duras was a pupil. 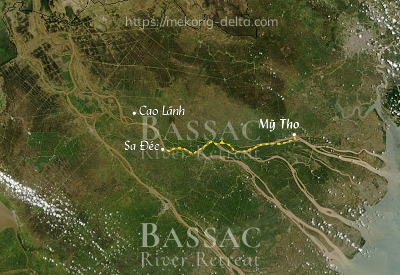 Dinner is served as the Bassac gets under way towards Cao Lanh then drops anchor at the entry of Cao Lanh for overnight. Breakfast is available from 6h30 AM. Check-out and transfer onto a local boat for a visit of a eucalyptus forest where the Xeo Quyt Viet Cong Base was nestled, a moving testimony to the harshness of the fights during the Vietnam war. If you are staying near Mỹ Tho, you may have a good time at The Island Lodge, at Michel and Françoise's on Thới Sơn island, facing the Mekong. The Island Lodge offers a relaxing experience by the pool, a view over the lush and ever-varied green of the countryside, and gourmet dining at Le Comptoir de Marthe et Édouard.